In 2010, there were 22 new posts, not bad for the first year! There were 2 pictures uploaded, taking up a total of 209kb. The busiest day of the year was February 11th with 350 views. The most popular post that day was Compiled List of Independent School Bloggers. 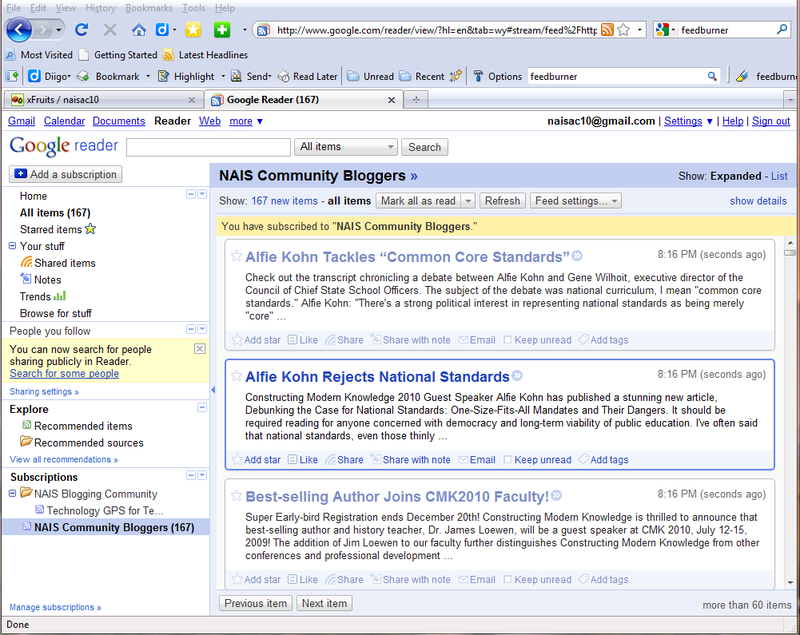 The top referring sites in 2010 were annualconference.nais.org, netvibes.com, twitter.com, digg.com, and stumbleupon.com. Some visitors came searching, mostly for nais conference, wil richardson nais quote, ruth huyler glass, nais conference 2010, and wordpress conference 2010. [Comment: I use EtherPad and have found it to be a wonderful tool for collaborative notes at conferences and in workshops I do and have several teachers using it at Greenhill. I noticed that Google purchased the tools and one can only guess what is going to happen to EtherPad. I am pleased to have run across the following from Tami. At least Google hasn’t purchased the entire Internet…Yet] I was talking w/an English teacher last week about Etherpad and did a demo w/my yearbook kids. Great tool, but going away, right? Well, it has been a while since I have posted TDF to the community. Such is life on spring break and the craziness of conducting a 3 three hour workshop and a concurrent session at a conference. Now I am in the middle of trying to get caught up. However, this morning seemed like a great time to do a little PD and I wanted to share what our community of bloggers has been writing over the past two weeks. Failure: “Many years ago, as a young physics teacher, I took great pains (and enjoyment) in designing all physics tests for my students after a particular lesson. I was not much for using the tests that come with the textbooks, but would rather cut and paste (literally) different test questions from different sources to make my test. Knowing that the 15 to 20 students in my class had grasped the knowledge to all different levels, the goal was to design a test that…”MORE. This is an interesting post that looks at how many communication devices are coming together into single devices while allowing cross communication (text to voice, voice to text etc). “No, Google has not taken over the University of California system. (Though there are some who may argue that they should. After all, Google has money and the UC system is broke!) No, what I mean is Unified Communications and Google. Unified Communications burst upon the scene in…MORE.